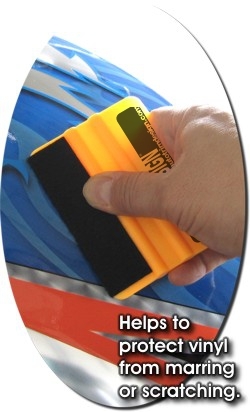 A stiff plastic felt edge wrapped application squeegee designed for the installation of vinyl decals and graphics that do not have protective application tape on the finished surface. Perfect for vinyl "wrapping" applications. The industry's original application tool and squeegee. Featuring high-stability twin ribs for easy handling and pressure control. Strong memory, medium flex and high glide combined with a soft, smooth and supple industrial felt edge. Helps protect vinyl from marring and scratching. Saves time and money by frequently eliminating the need to "wrap" a Squeegee, or using a premask. Ideal for vinyl, film, decals, graphics, tape, silk screen and pressure-sensitive applications such as InvisiGARD Paint and Headlight protection films. 4"x 3" (101.6mm x 76.2mm).